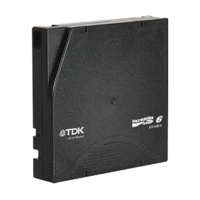 The next generation in the Ultrium® format of Linear Tape- Open® (LTO) Technology - LTO 6 Ultrium tape cartridges join the TDK Life on Record portfolio. The latest LTO 6 technology features increased capacity (6.25TB) and faster transfer rates (400MB per second) for improved storage optimization. Available for use within any drive or system built for LTO 6 technology. -Advanced Servo Writing Technology: Ensures precise alignment between drive head and data tracks for greater reliability. -Patented Corner Snap: Improves cartridge strength and protects data during shipping or handling. -Patented Three-piece Tape Spool: Distributes stress more evenly over the tape surface for better performance and longer archival life.